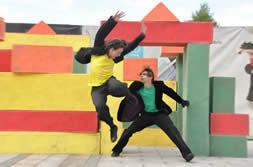 Merging the worlds of dance, music and architecture, Dance Theatre of Ireland have toured Block Party! to rave receptions from Festivals and audiences all over Europe, Ireland and Korea. 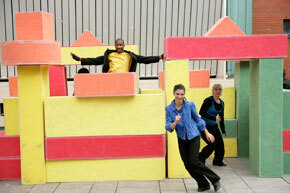 Roving dancers and musicians, flying blocks, vanishing structures, instant architecture - it’s a BLOCK PARTY! Five dazzling dancers, plus explosive percussion played live by Brian Fleming & friends, perform this movable feast for the eyes and the senses, for the adult and the child (in you). This Outdoor Spectacle will immerse you in a vibrant world of colour and play with giant-sized Toy Blocks, creating designs more clever than a Rubik’s Cube on pointe. Choreographed by DTI Artistic Directors Robert Connor & Loretta Yurick. 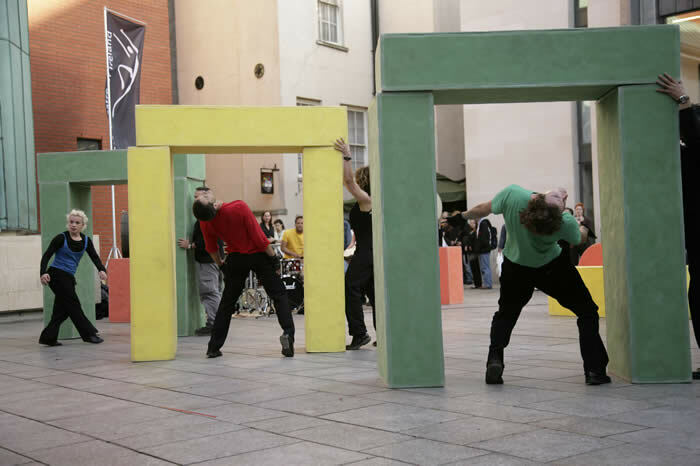 Innovative sculptor Andrew Clancy created the Blocks and dancers include: Adam Murphy, Khyle Eccles, Cosimo De Tommaso, Kathleen Doherty, Mirjam Gurtner, Jessica Rowell and Sandro Franchini.